Caption: Calcareous Sponges, Lemon Sponge Coral, Yellow Sponge Coral, Coral Reef Sponge, Red Sea Sponge, Indo-Pacific Coral Reef Sponge and Marine Sponge. 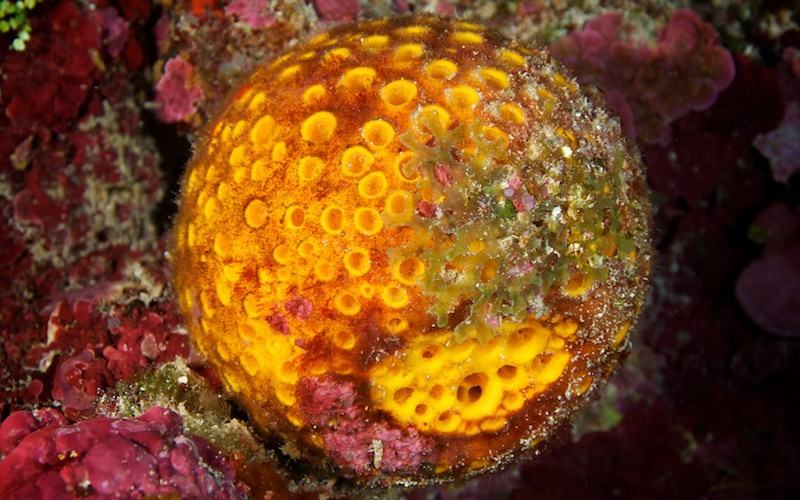 Found on coral and rocky reefs hanging from deep water caves or shady drop off's often growing downwards. They feed on plankton. Length - 17cm Depth - 20-30m Widespread Indo-Pacific Sponges come in a range of sizes from minuscule encrusting species under rocks to massive sponges which can be up to one and half metres high. They are able to filter many litres of sea water every few seconds. Sponges can exude highly toxic chemicals and so have very few predators apart from nudibranchs, sea stars, sea urchins and umbrella shell. Their colour can vary if growing in the light or when growing in the shade.